A businessman has accused online tat bazaar eBay of trapping him in a Catch-22 style data retention loop after blocking him from deleting his company’s account on the site. Richard Stebbings, owner of transit box biz Panzer Cases, told us eBay was refusing to delete his account by implementing odd rules – which may put it into conflict with the EU’s forthcoming General Data Protection Regulation. Earlier this year Panzer Cases’ seller rating fell below the auction site’s quality threshold and was 'frozen' (as distinct from a ban), which Stebbings blamed on automated auction software causing problems. Five customer purchases were cancelled after what he described as the software generating listings for items that were out of stock. He said that all the affected customers were contacted and refunded. eBay told The Reg that the cancelled transactions had broken its rules and triggered the site’s fraud protection measures. After phoning eBay’s customer support line and “speaking to 4 different people as it escalated through various managers” Stebbings alleged he was told “the information on the account is being kept for eBay’s benefit” and that “the information stored on the account is now useless to me and so it is OK to be there”. 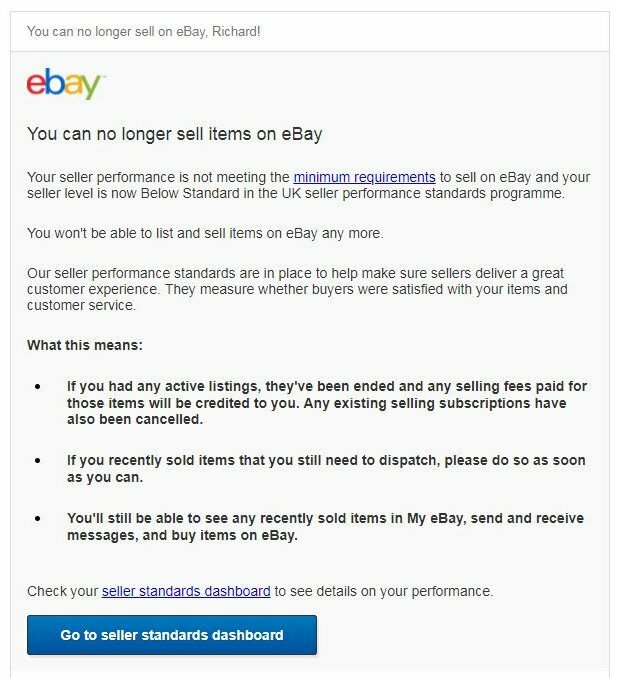 eBay followed up on Stebbings' protestations with an email, seen by us, stating: "We carefully reviewed your account and determined that it doesn't meet our minimum seller performance standards. For this reason, your account is permanently restricted from selling." He also told El Reg that additionally his personal account had been frozen at the time the business account was locked up, seemingly because it shared a registered postal address with the latter. We understand that eBay’s position is that because it had flagged the Panzer Cases account as fraudulent, the web souk does not want to re-enable its ability to make sales. Oddly, however, purchases can still be made through it, as eBay confirmed to The Register. The EU's General Data Protection Regulation comes into force on 25 May and includes a right of erasure, meaning companies must delete data if they no longer have a reason for processing it and the data subject asks them to. In other words, businesses can keep hold of information if they can argue there is a legitimate reason to do so – for example, a bank might try to argue it can keep a log of missed credit card payments so as to calculate accurate credit scores.